Villa Levante is a perfect choice for anyone wanting a central location with everything you need on your doorstep! The lively Praia D'Oura Strip and beautiful sandy beach are both within 5 minutes' walk from the house with a wide choice of shops, bars and restaurants. This 2 bedroom villa has a private pool where you can relax during the day. By night take a short walk and experience this vibrant resort! Pool heating, WiFi and air conditioning/heating in all the bedrooms are included. The location is second to none! Perfect if you want to be a stone's throw from the beach, shops and restaurants! Outside, the private pool is set in a lawned area, surrounded by hedges, which gives a sense of privacy. 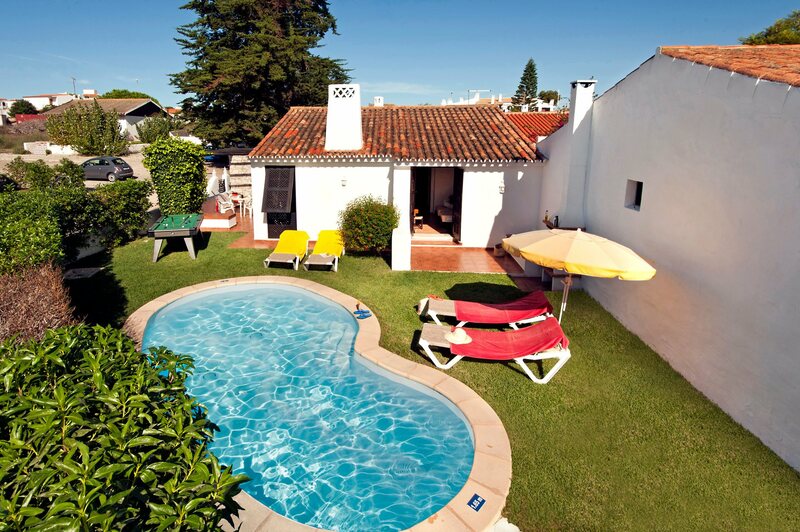 There's sun loungers where you can relax and enjoy the Portuguese sunshine, with a BBQ to one side of the pool. The terrace is partially shaded by a wooden pergola, tucked around the side of the villa, with a dining table and chairs. There is parking bay on the street for your hire car should you choose to have one. Entrance to the villa is through a gate and up a small path leading to the front door. The open plan living area is bright and airy. There is a compact kitchenette and dining table with chairs and patio doors leading out to the terrace. One step down takes you to the lounge with a seating area, flat screen TV and feature fireplace. The villa compromises of 2 twin bedrooms which are brightly furnished and have built in wardrobes. One bedroom has patio doors leading straight out to a small terrace area and the pool area. The other has patio doors leading out to side of the villa. There is also a separate bathroom with overhead shower. This villa has applied for a licence and the submission number is AlojLocal/2009/47. The licence number will follow. Villa Levante is a semi-detatched property in an enviable location within one of the Algarve's most popular resorts - Praia D'Oura. About 5 minutes' walk from the villa will take you to the beach and a great choice of shops, bars and restaurants on the famous Praia D'Oura Strip. Situated in a cul-de-sac our villas Sunshine and Sueste can also be found here. If you fancy a day exploring, Albufeira is just 5 minutes' car ride away, with a beautiful long, sandy beach and plenty of places to eat, drink and shop - fabulous! There is a wide choice of shops to get all your holiday essentials and souvenirs along the Praia D'oura Strip. The older part of Albufeira is ideal to get a taste of the past with narrow, cobbled streets and an array of shops selling traditional Algarve trinkets and handcrafted gifts. Many streets have a lively atmosphere, particularly in the large square with the occasional live music contributing to this vibrant holiday resort. A wide choice of restaurants, cafes and bars are to be found in Praia D'Oura. There's a popular nightlife scene along an avenue known as The Strip which is perfect for anyone wanting a lively atmosphere! There are all kinds of bars, entertainment venues and the popular Kiss disco/nightclub. Praia D'Oura derives its name from the beautiful, golden sandy beach at the bottom of the hill. Albufeira Beach is beautiful and has an expansive sandy beach flanked by dramatic cliffs and rock formations. For more relaxing surroundings, a string of picturesque cove beaches can be found just to the west of Albufeira, such as Coelho, Castelo and Galé. There is a choice of water-slide parks, the Zoomarine aquarium and dolphin show, all of which are within a 20 minute drive from Villa Levante. The Chic Vilamoura has an international marina, casino, shops and restaurants and is well worth a visit for a day or evening out. For golfers, the 9-hole Sheraton Pine Cliffs course is nearby at Olhos de Agua, with 3 full courses, about 25 minutes' drive away at the stylish Vilamoura. Villa Levante is not available to book for season as it is sold out. Take a look here at the Algarve villas that are currently on sale. 'If you fancy the idea of a game of bowls, cucumber sandwiches, Pimms and a great view of the sea, make sure you call in at Club Praia d’Oura. Villa Lavante was excellent!! In a beautiful area with many restaurants and little shops to buy fresh bread and other staples from. Even though it was close to 'the strip', you could not hear any noise at night. Would definatly go back to the same villa in a heart beat!! Villa was as described- we were completely satisfied as to all descriptions and the setting was ideal. Have used lots of companies over the years but certainly this one is one of the best.